The WRF-H2N Foam Windscreen and Fur Windbuster Kit from B&H includes the WRF-H2N Foam Windscreen for the Zoom H2 and H2N recorders (sold separately) and the WSW-ZHU Universal Fur Windshield for portable recorders. This kit can be used to reduce broadband wind noise with minimal high-frequency loss and protects the microphone elements from wind pressure without muffling the sound. The WRF-H2N Foam Windscreen for the Zoom H2n is made from specialty acoustic foam designed to reduce broadband wind noise with minimal high frequency loss. The density of the foam is optimized to help protect the microphone elements from wind pressure without dramatically muffling the sound. This windscreen is most effective in calm to light breeze conditions (0-7mph), and can be used indoors for protection against drafts caused by air-conditioners. It also reduces vocal plosives in close microphone placement situations. Users can generally expect a 4dB to 8dB reduction in wind noise, with very slight dampening of high frequencies. For most applications, the very slight high frequency dampening is a worthwhile exchange for the notable wind noise reduction. The WRF-H2N's foam is hypoallergenic and washable and helps prevent moisture and dirt from damaging your microphone. The windscreen is designed to fit over the microphones of the H2n handheld recorder. The WRF-H2N Foam Windscreen for Zoom H2n is an effective solution for basic wind protection. 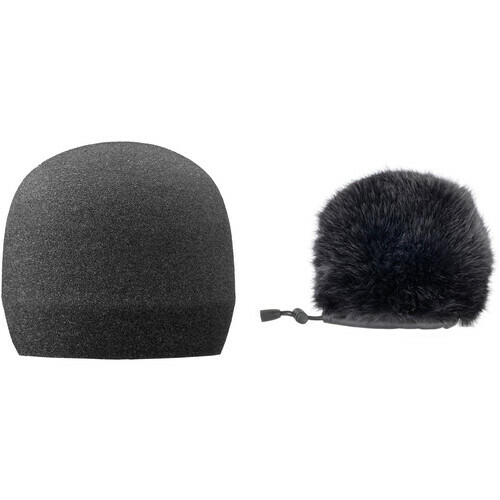 The Auray WSW-ZHU is a universal fur windshield offering secure attachment and up to 40 dB of wind-noise reduction for mobile journalists, location recordists, vloggers, and more. Compatible with all Zoom Handy recorders, the Zoom iQ5 stereo microphone, select portable recorders from Olympus, Roland, Sony, and Tascam, and most recorders with top mics up to 4.25" wide, it fits over your existing foam windscreen, and features a drawstring and cordlock to ensure a snug fit. The WSW-ZHU fur windshield grants two layers of defense against wind, dust, dirt, and moisture. The dense non-shedding simulated fur forms the exterior, while lint-free acoustic cloth lines the interior. Record outdoors with confidence knowing that your microphone will be protected and your audio will be cleaner. Foam windscreens are typically insufficient for impeding noise from the strong winds often encountered when shooting outdoors. Fit the Auray WSW-ZHU fur windshield over your foam windscreen to achieve up to 40 dB of wind-noise reduction. In addition to providing 30 to 40 dB of wind-noise reduction, the Auray WSW-ZHU guards your sensitive mic capsules against damage from airborne dust, debris, and moisture. Record with confidence in a variety of outdoor environments. Use the Auray Fur Windshield with an array of devices. It fits all Zoom Handy recorders such as the H4n, the H6, and even the Q2HD Handy video recorder. It's also compatible with the Zoom iQ5 stereo microphone. The WSW-ZHU fur windshield fits many portable handheld recorders from Olympus, Roland, Sony, and Tascam. If you have a recorder with top mics up to 4.25" wide, the WSW-ZHU is compatible. Thanks to the WSW-ZHU's drawstring, cordlock, and leatherette binding, you can ensure a snug, proper fit that keeps wind out. The windshield's exterior is made of thick simulated fur designed for effective reduction of wind noise. By utilizing non-shedding fur, it maintains reliable effectiveness shoot after shoot. The interior is lined with acoustic cloth to impede contact noise and provide an extra layer of protection against incoming gusts of air. Additionally, the material is lint-free for assurance that your microphone's diaphragms won't be subjected to errant fibers. Box Dimensions (LxWxH) 6.1 x 4.9 x 2.2"